Hello World Badge kit is designed for friends and family of the parents-to-be who will get their very own badge with this cool kit! 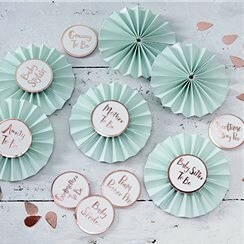 There are 6 pretty mint green pinwheel badges and a choice of 9 stickers with rose gold foil to add onto each one. With titles including ‘Granny to Be’, ‘Baby Stylist’, ‘Aunty to Be’ and ‘Pram Pusher Pro’, there’s something for everyone! Includes 6 Badges and 9 Stickers.